Thursday’s Game 5 of the NHL Stanley Cup Playoffs could determine this year’s champion. But demand is falling, since the team that could clinch at T-Mobile Arena isn’t the Vegas Golden Knights. The average asking price on the secondary market for a ticket to Game 5, according to TicketIQ.com, has fallen 43 percent between May 29 and June 5. The average asking price was at a high of $2,666 in late May, but two days out from the game, it’s $1,515. The get-in price has dropped 12 percent, from $875 to $766 in the same time span. All season long, it’s appeared that the Golden Knights, a first-year expansion team, would defy the odds and become the first expansion team across all professional sports to win a league title. But the Washington Capitals, who haven’t won a Stanley Cup since the team was founded in 1974, enter Game 5 with a 3-1 series lead. If the Golden Knights can win game 5, fans in DC will be paying quite a bit to see if the Caps can close out the series at home. Currently, the average asking price on the secondary market for a possible Game 6 is up 72 percent from a week ago, from $2,225 to $3,845 on June 5. And the get-in price for that game has nearly doubled, from $867 to $1,733. Those prices are the highest for the series, which continues with Game 5 on Thursday night in Las Vegas. Before the Stanley Cup Finals started, the average asking price for a ticket in Las Vegas was more than $150 more expensive than a ticket in Washington. That gap remained about the same after the Golden Knights won Game 1 and the Caps won Game 2. But as of May 31, the average asking prices flipped, with Caps tickets seeing higher demand. On May 31, the average asking price for games in Washington was $2,115 and $1,961 in Las Vegas. As of June 5, the average asking price in Washington was $3,109, compared to $1,834 in Las Vegas. The current average asking price for the series overall on the secondary market is $2,353, which is by far the highest of the decade. The next most expensive Stanley Cup Finals was the 2014 Los Angeles Kings-New York Rangers series, for which fans paid an average of $1,573. Despite the drop in asking price in Las Vegas, there are still only a limited number of tickets left available on the secondary market. According to TicketIQ.com, 572 tickets remain for Thursday’s game and only 264 are available for the if-needed Game 7. Las Vegas just can’t get enough of its only pro team. After the Golden Knights won Game 1 on the Stanley Cup Finals on Monday, demand for tickets has continued to rise. According to TicketIQ.com, the average asking price for a ticket to tonight’s Game 2 against the Washington Capitals is up 14.5 percent, from $1,570 to $1,731. The Golden Knights have already made history as the first expansion team in a major professional sport to get to a league final series. And should they beat the Capitals, the Golden Knights will stand alone as the only expansion team to win a league title in its debut season. 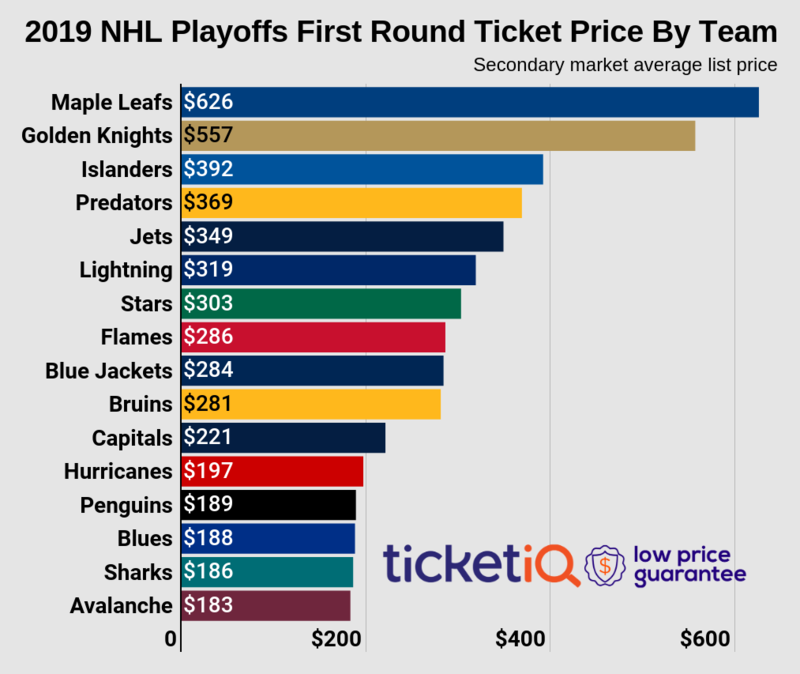 Just getting in the door to tonight’s game will cost more than the average price fans paid on the secondary market to get into the conference finals. The get-in price for T-Mobile Arena for Game 2 is $710. That represents a 28 percent increase over Game 1. The average asking price on the secondary market for a ticket to the series at T-Mobile Arena is $2,108, up from $2,052 earlier this week, and ranked No. 4 for the decade. The most expensive home ticket in NHL Stanley Cup Finals history was $2,664 in 2017 to see the Nashville Predators play at home. That series, which the Preds lost, went six games. Game 2 is the only sure remaining game at T-Mobile Arena. The average asking price for an if-needed Game 5 is down more than $100 from $2,666 to $2,548, but the average asking price for a possible Game 7 has risen from $2,319 to $2,497. There are very few tickets remaining on the secondary market, according to TicketIQ – 329 for tonight’s game and fewer than 285 each for Games 5 and 7. This series overall will likely be the most expensive in history. The current average asking price for all games is sitting at $1,999, more than $400 more than the second-most expensive of the decade, the 2014 Los Angeles Kings-New York Rangers series, which settled at $1,573. Demand for tickets to see the Vegas Golden Knights make history may not be the most expensive history – but they’ll be close. According to TicketIQ.com, the current average asking price on the secondary market to see Vegas play at home in the Stanley Cup Finals is $2,505. That’s the second most expensive Stanley Cup ticket of the decade behind $2,664 for the 2017 Nashville Predators. The Golden Knights are the first expansion team across any American major professional sport to reach the league championship. They’ll the play the Washington Capitals, who have never won a Stanley Cup, beginning Monday at T-Mobile Arena on the Las Vegas Strip. Vegas defeated the Winnipeg Jets in the Western Conference Finals and will have been off for eight days before the finals start. The series as a whole is the most expensive on the secondary market since TicketIQ began tracking data. With an average asking price of $1,983, it is nearly $500 more expensive than the second-highest average asking price, $1,573, for the 2014 Los Angeles Kings-New York Rangers matchup. The get-in price at T-Mobile Arena is $925, making it the most expensive on the secondary market ahead of the $904 get-in price to see the Capitals at home this year and $890 to see the Rangers at Madison Square Garden in 2014. Key drivers of the high prices are Games 5, 6, and 7 – all to be played only if needed. The highest average asking price for any game in the series is $3,667 for Game 7 in Las Vegas, followed by $3,227 for Game 5 in Las Vegas and $2,902 for Game 6 in Washington. The lowest asking price is $1,623 for Game 2 in Las Vegas. With the NHL’s Western Conference final series tied at a game apiece, demand on the secondary market for Golden Knights playoff tickets remains strong, according to TicketIQ.com. As the series moves to Las Vegas’ T-Mobile Arena on Wednesday, the average asking price on the secondary market for seat is $618 – the highest among any of the teams still playing and the seventh-most expensive since TicketIQ.com began tracking data in 2011. The average asking price has slipped 17 percent since Friday. The average asking price to see the series in Winnipeg, where the Jets play, is $566, and the overall average asking price for the series is $588, the second-highest average asking price of the decade. Only the 2017 Anaheim Ducks-Charlotte Predators series, which averaged $652 per ticket, was more expensive. When the puck is dropped in Game 3 at T-Mobile Arena on Wednesday, fans will have paid an average of $692 to see the first professional conference series in any pro sport in Las Vegas. Only the if-needed Game 7 in Winnipeg, for which the average asking price on the secondary market is currently $726, is higher. The Vegas Golden Knights have been making history on the ice all season and now they’re making it at the box office. The expansion team that has now advanced to the NHL’s conference finals and Golden Knights playoff tickets have the highest average asking price for the Western Conference Finals since TicketIQ.com began tracking data in 2011. The $823 asking price is the third most expensive this decade for any conference final. The most expensive was $1,207 to see the New York Rangers play at home in 2015, and the priciest was $954 to see the Rangers at home in 2014. Only teams already set for the conference semifinals – Vegas beat San Jose in six games to advance in the West and Tampa Bay swept Boston to advance in the East. Vegas will play the winners of the Nashville-Winnipeg series. Vegas is making history with every game as the first expansion team across any sport to get this far in the playoffs – and it’s no fluke, the Golden Knights swept Los Angeles in the conference quarterfinals and won two straight to beat the Sharks, after the teams split the first four games. That excitement has translated into high ticket prices as fans don’t want to miss any of the action. The Golden Knights will host at least the two games of the conference finals, but it is the if-needed third game that currently has the highest asking price -- $923. The first two games are going for $723 and $829, respectively, on the secondary market. The lowest get-in price of their home games is $352, the most expensive get-in price we've ever tracked for a conference finals and a 126 percent premium over the conference semifinals. The Vegas Golden Knights continue to make history. One of only two teams to sweep in the Stanley Cup quarterfinals, the expansion team becomes the first in NHL team in history to move on to the conference semifinals, where they’ll play the San Jose Sharks. If there was ever a question about how Vegas would receive a pro team, Knights fans are answering with plenty of support. According to TicketIQ.com, the current average asking price on the secondary market Golden Knights playoff tickets for the Sharks series is $402 – and $529 for games at T-Mobile Arena on the Las Vegas Strip. In the first round, fans paid an average of $484 on the secondary market for Knights home games. The cost to see the Knights in the first round at home was the third highest across the NHL, behind only Toronto ($652) and Winnipeg ($489). How the second-round asking price will compare remains to be seen, as other series wrap up through the weekend. The price just to have a seat at T-Mobile Arena is also high – the lowest get-in prices for the series was $156 for Game 1, while the highest is $270 for Game 7. For comparison’s sake, the average asking price for a ticket at San Jose is $328 and the current get-in price for Games 3 and 4 is just over $100. The Vegas Golden Knights weren’t supposed to be a factor in the NHL this season, but in their inaugural season, the Golden Knights are, according to FiveThirtyEight, the best expansion team in any sport. Ever. So making the playoffs shouldn’t come as a surprise. And when the Golden Knights open the first round of the Stanley Cup Playoffs on Wednesday against the Los Angeles Kings, getting a ticket to T-Mobile Arena will cost a pretty penny. The current average asking price on the secondary market for Golden Knights playoff tickets at home is $453. That number is 163 percent higher than the average price for Game 3 at Staples Center ($172) – and it represents a 131 percent increase over the average asking price for a regular-season game ($196). The playoff opener won’t be the only pricey ticket at T-Mobile – the current average asking prices for Games 2 ($426) and 5 ($446) are already above $400. But most stunning may be this number: $501. According to TicketIQ.com, that is the current average asking price on the secondary market for a potential opening round Game 7 at T-Mobile Arena. The get-in price for that game is currently $350. There isn’t a more expensive NHL playoff ticket anywhere in the U.S. In fact, the average asking price for Game 1 is second in the league to only the Maple Leafs – and they’ve been playing hockey in Toronto for more than 100 years. The average asking price for all Vegas games at T-Mobile Arena is currently $453 while the average at Staples Center is $172. With an 51-24 record, the Golden Knights won the Pacific Division and had the fourth-most wins in the NHL during the regular season. Only Atlantic Division winner Tampa Bay (54-23), Central Division winners Nashville (53-18) and Central Division runners-up Winnipeg (52-20) won more games this season.